The Monte Cristo Sandwich is a breakfast twist on a classic ham and cheese. 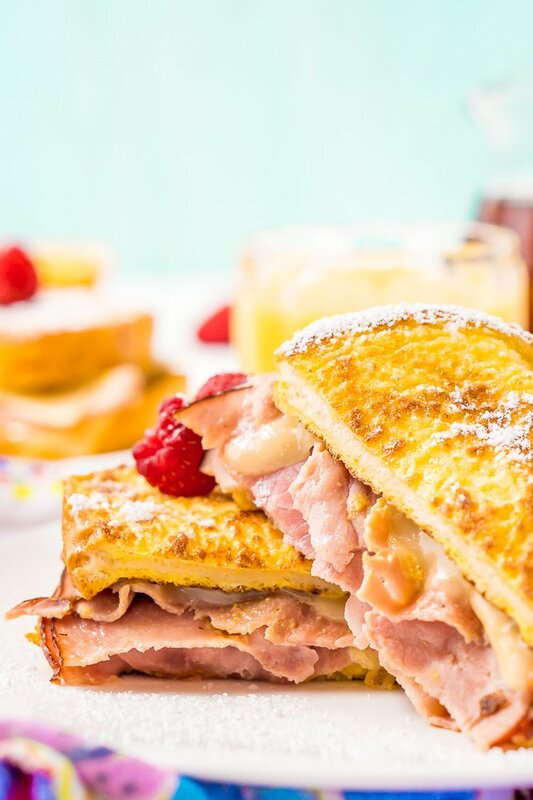 Tender slices of deli ham are sandwiched between two pieces of French toast and melty cheese for an addictive dish you’ll want to make over and over again! A Monte Cristo is like a cross between French toast, a grilled cheese, and a ham sandwich. Basically, it’s a combination of comfort foods you’ve loved since childhood! I think one of the best things about brunch is that it usually has both sweet and savory elements: pancakes, French toast, and maple syrup are especially scrumptious when served alongside bacon, home fries, and eggs. 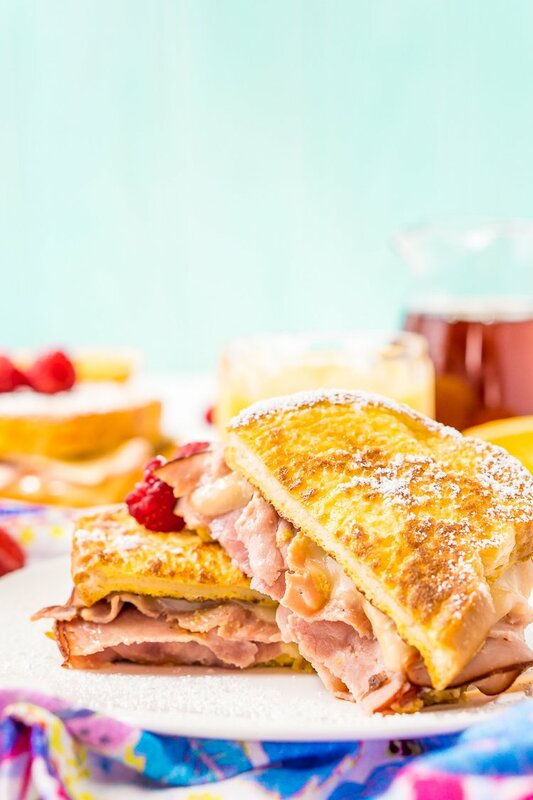 If you crave salty-sweet foods at breakfast time, you’ll love this Monte Cristo Sandwich recipe, which combines the best of both worlds in one dish! I’m excited McKenzie Natural Artisan Deli is sponsoring today’s post so I can share this super tasty recipe with all of you! All opinions are 100% my own. I like to think of it as a kind of brunch sandwich. It includes some of the best parts of a traditional brunch, only it’s way quicker and easier to make than each individual dish. I decided to make Monte Cristos at home after trying McKenzie Artisan Honey Uncured Ham. The smoky flavor of the ham combined with a touch of honey is so good that I didn’t want to wait until lunchtime to enjoy it! Now that I’m pregnant — and indulging in my cravings — I sometimes get a hankering for several things at once, and this recipe checks all my boxes. 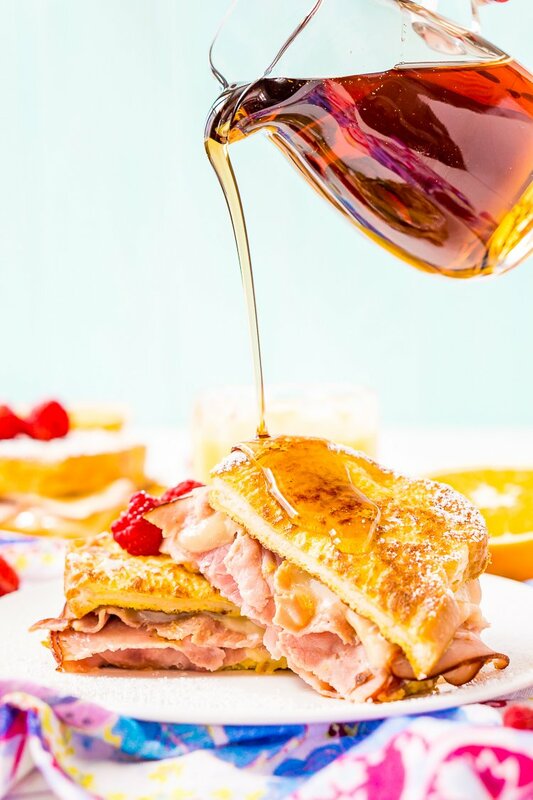 Tender ham, soft French toast, and ooey gooey cheese … I even like to dip this sandwich in maple syrup! After becoming hooked on McKenzie Artisan cold cuts, I knew that they’d make the best cheese for this recipe. And when I tasted the finished product with melted Mckenzie Artisan Vermont Swiss Cheese, I was not disappointed! With McKenzie Natural products, the quality is not only in the taste, but it’s also in how they’re made. McKenzie sticks with all-natural ingredients, makes cold cuts from whole muscle meat, and never uses hormones or antibiotics — ever. I’m also happy to know that when I buy McKenzie products, I’m supporting a New England business. These meats and cheeses are crafted in Vermont and are sold right at my local Shaw’s (and at Shaw’s stores across New England). Monte Cristos served with mimosas, orange juice, or coffee is a match made in heaven for an easy brunch dish. However, this Monte Cristo Sandwich is great for breakfast, lunch, and dinner. The key to making it great is by using premium ingredients, so pick up some Mckenzie Natural Artisan meats and cheeses at your nearest Shaw’s! 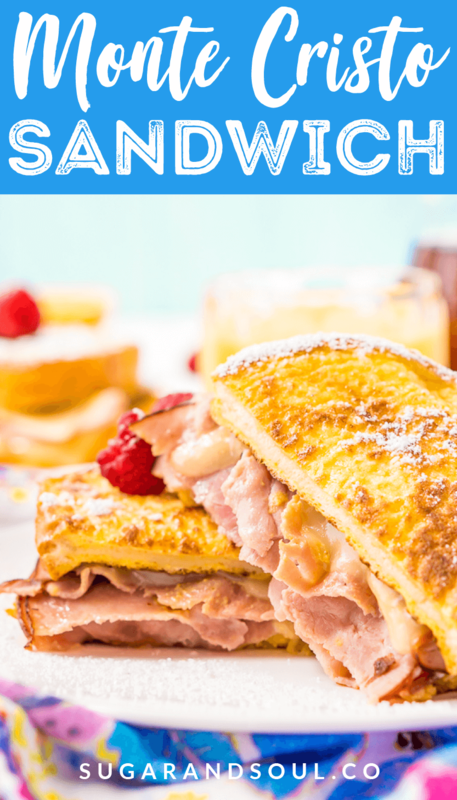 Pin this Monte Cristo Sandwich Recipe for Later! 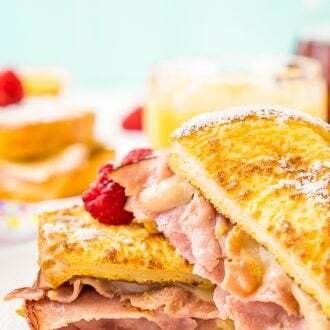 The Monte Cristo Sandwich is a breakfast twist on a classic ham and cheese. 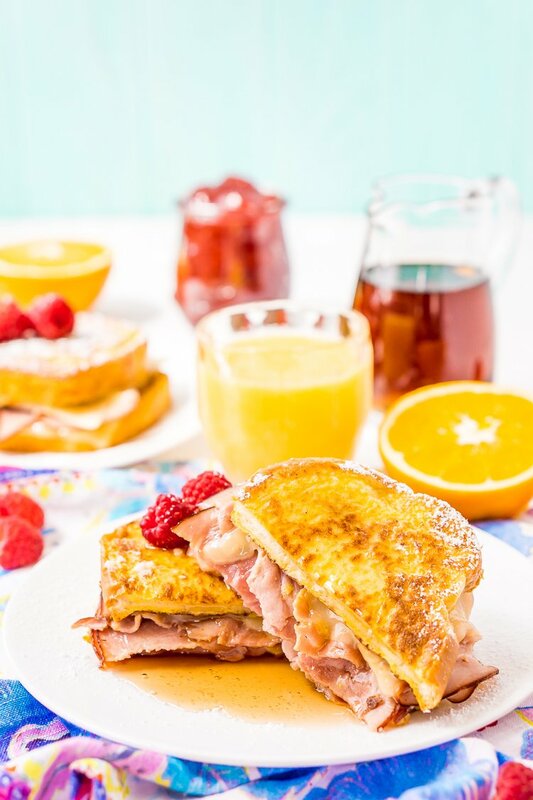 Tender slices of deli ham are sandwiched between two pieces of French toast and melty cheese for an addictive dish you'll want to make over and over again! In a medium bowl, beat together the eggs, milk, and vanilla and set aside. Assemble two sandwiches using two slices of bread for each and dividing the McKenzie Artisan Uncured Honey Ham, McKenzie Artisan Vermont Swiss Cheese, mustard, mayo, and preserves evenly between the two sandwiches. Carefully dip the sandwiches in the egg mixture to coat like you would French toast, keeping the sandwiches assembled while you do it. Place the sandwiches in a large skillet with butter and cook over medium-high heat until the bread is a golden brown and the cheese has melted. Remove the sandwiches from the pan and dust with powdered sugar and serve with maple syrup.